Increase both the convenience and efficiency of your standard kitchen sink with the Advance Tabco CRC-84C-R stainless steel bar sink and ice bin combo unit! Featuring 4 one-piece deep drawn sink bowls that measure 10" x 14" x 10" along with a pair of 12" drainboards, this versatile unit will keep the rinsing, washing, and storage requirements of your high-volume operation within arm's reach. This unit boasts a 54 lb. capacity insulated ice bin with built-in 1" IPS drain to the right of the sink bowls. This bar sink combo item is designed for exceptional durability and years of high volume use thanks to sturdy construction and a 4" backsplash, along with adjustable side cross-bracing. Wash all your restaurant and kitchen supplies with the unit's two 12" deck mount swing spout faucets. Additionally, each sink bowl has a 9" high overflow pipe with 1 1/2" IPS drain. Two injection molded plastic bottle racks are included, and a rear deck provides further storage capabilities. 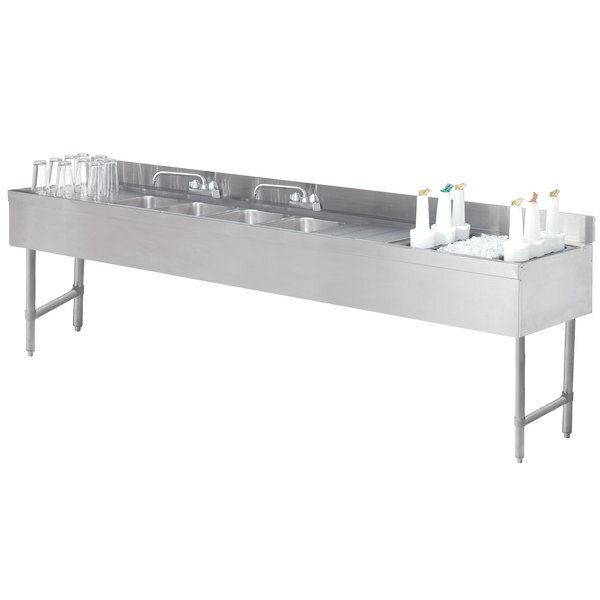 Each faucet meets federal lead free standards, making this Advance Tabco CRC-84C-R bar sink and ice bin combo the perfect addition to any commercial bar or drink-serving application.